Most tourists stick to the beaten path, visiting the major and popular destinations throughout beautiful Tuscany, and there’s nothing wrong with that. However, if you are at the “been there, done that” stage, here are a couple of tips to take you a little off that beaten track and into some surprising adventures. Having settled yourself into your Tuscany holiday villa through Bridgewater's Idyllic Italy, make sure you have camera in hand and head off on a visit to the ancient Etruscan past. Way in the distant past, Tuscany was home to one of the most ancient civilizations, who made their mark long before even the Romans came along. The Etruscans, a powerful civilization who occupied the area in the way distant past, have left some really incredible hikes for us modern mere mortals to explore. 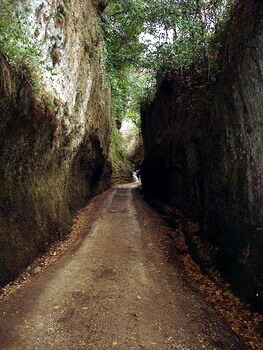 One of these hikes is known as the Vie Cave (or excavated roads), which is a network of roads carved into the solid stone walls, linking an Etruscan necropolis with several different settlements in the area, Sovano, Sorano and Pitigliano. These roads are carved into what is called the “Tuff,” which is a kind of rock made of consolidated volcanic ash, ejected in the distant past from vents during a volcanic eruption. No one really knows for sure why the Etruscans went to so much trouble to carve out these roads and there have been theories that they are either water channels, or, due to the link to the Etruscan necropolis, possibly these were sacred roads connecting sacred grounds to burial areas. As some of the walls are over twenty feet high, possibly these walkways served as a defensive system against invaders. Whatever their original usage, nowadays this is makes for a popular hiking area for both young and old with some interesting sights to see along the way. 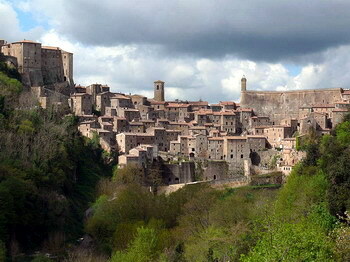 While walking the Vie Cave, Sorano is an excellent visit. This town and comune in the province of Grosseto, is an ancient medieval town, which hangs from the tuff stone of the hillsides overlooking the Lente River. Sorano photo CC-by-SA Zyance The town of Sorano has seen a few great civilizations, including the Etruscans and eventually the Romans, and the entire town is steeped in history. Strolling the medieval streets is fascinating and special visits are to the Rocca degli Orsini or Orsini castle, built back in the 14th century and renovated in 1552. In the Sorano area can be found the ruins of the San Rocco church, which still retains part of the original walls, and behind the church is a huge Etruscan necropolis with several tombs carved into the tuff. Another site of interest is the Masso Leopoldino, which is carved from the natural tuff stone in the area to form a fortified, panoramic terrace. While in the past this was obviously a security measure, today the terrace gives a fascinating vista over the area. Another branch of the Vie Cave takes the visitor to Pitigliano, a quaint and beautiful medieval town which is known as “The Little Jerusalem,” due to the historic presence of a Jewish community in the town. The community of Pitigliano has a synagogue and a cemetery. Again a major location for the Etruscans and the Romans, a popular spot to visit in the town is the Tempietto (or small temple), which is a natural cave reworked by human hand into a small temple, just outside the central area, above the Lente valley. The reason for its being is still unknown, but theories are that it dates back to Late Antiquity or the early Middle Ages.